Read for yourself. In their own words. Here we have Kate Matteson, a Democrat who is running for Assembly against Republicans Parker Space and Hal Wirths. There you have it. 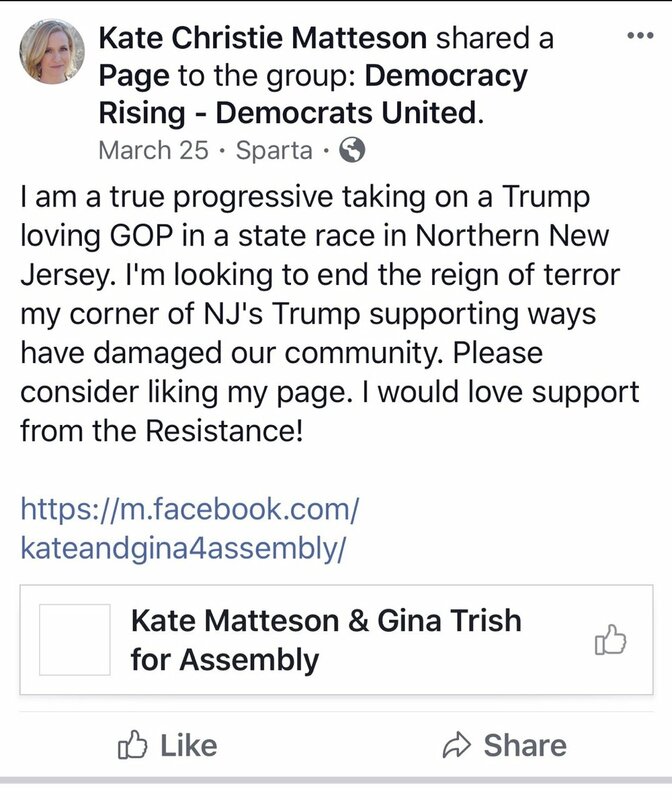 Kate & Gina "would love support from the Resistance" -- also known as "ANTIFA". Violent and crazy ANTIFA. Why would anyone want their support? Kate and her running mates Jennifer Hamilton, Gina Trish, and Dan Perez love Phil Murphy and his sanctuary state plans so much they would pull down a statue of George Washington just to erect something in homage to Murphy. The whole ticket is nuts this year. Bring back Bill Weightman!